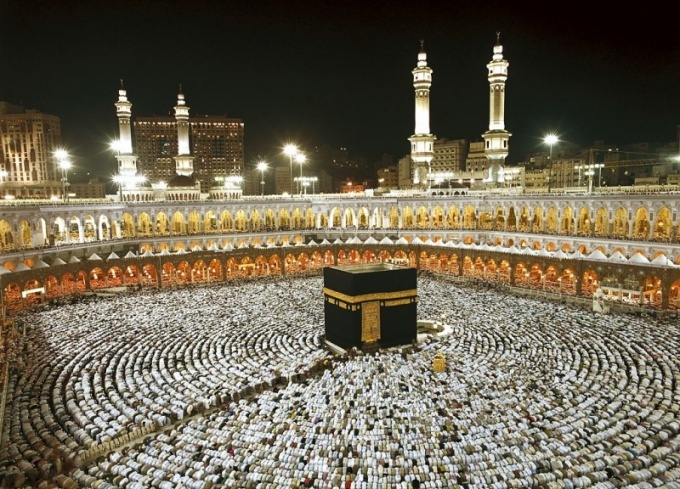 The Kaaba, which literally translated from Arabic means "cube", and in the more accurate context "tall, revered place," located in Mecca, site of the Haram is sacred to Muslims. The Kaaba is one of the Central characters in Islam, it was her turn, the views of Muslims all over the world during prayer. The Kaaba is a "Sacred house", a house of prayer. Over its long history, the Kaaba was repeatedly destroyed and rebuilt, so its current size and the device is a little different from the first building for the worship of Allah, which was built according to legend, Adam's son - SIS. Access to the Kaaba closed, and to enter it might have a very limited number of people and only during the washing of the Kaaba, which is held twice a year - before the celebration of Ramadan before the Hajj. Today, the Kaaba stands on a marble Foundation, the corners directed to the cardinal points and are the corresponding names. Construction is always covered with a special black silk veil on which are embroidered the Golden words of the Qur'an. In the Eastern corner of the Kaaba the black stone embedded in a silver frame, the apparent size of his 16х20 see the stone - object of special veneration and worship of Muslims. According to legend, the stone was betrayed by Allah to Adam, but then the stone was white. Over time, the stone turned black by absorbing the sins of men. With the Kaaba is associated with many fables, legends and myths. Especially a lot of questions and causes the inner contents of the Kaaba. Spoken of as the mysterious writings and the relics stored within it, and about the treasures hidden in its walls. In fact, nothing inside the ka'bah there, it is really of great value for Muslims, but the value is of a spiritual nature. If we talk about treasure, then they can be attributed only more than two hundred kilos of gold used in the decoration of the doors and the interior space of the room. Artificial lighting inside the ka'bah there. The door to the Kaaba plated with gold and engraved texts of the Koran, the floor and walls are tiled with marble slabs. One of the floor slabs is visually different from the others, according to the legend here was praying, the prophet Mohammed and is a place for Muslims special. Posted on the walls and ornaments, plaques with texts about the rulers who took part in building the ka'bah. The roof is set on three pillars, each of which bears the name of the angel. On the beams between the columns are hung with vintage lamps and filled with incense, the walls and ceiling are covered with silk.